Discover the Amazing Canals of Leonardo da Vinci with 1-hour boat tour. The Navigli, Milan’s ancient canal system, was built by Leonardo da Vinci. 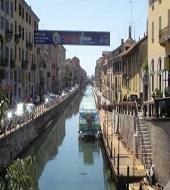 Start your mini-cruise in the “zona Navigli” – a fashionable area of Milan – en route to the “conche”. From Milan, you will visit San Cristoforo, Darsena, Conchetta and then return. Multilingual commentary Italian, English, Spanish. At the moment, it is not possible to book the Canal Cruise. We recommend that you purchase the Milan City Pass which includes the Canal Cruise and many more. You can find more information here! From monday to thursday 1:35 p.m., 2:35 p.m. , 3:35 p.m. , 4:35 p.m.
friday, saturday, sunday 11:35a.m. , 0:35p.m. , 1:35p.m., 2:35p.m. , 3:35p.m. , 4:35p.m. , 5:35p.m. The canal cruise is only available from April to September. Buy your tickets online and skip the line! The ticket is valid any day!